Casting the new treble bell for Sheffield Cathedral. The Parish Church of St Peter, Sheffield - since 1914 the Cathedral Church of St Peter and St Paul - is one of the oldest centres of change-ringing in Yorkshire. It obtained a ring of six as early as 1689. In 1745 this was replaced by a new ring of eight, cast by Daniel Hedderly, who operated from foundries in Bawtry and Derby but is believed to have cast at least the tenor (33cwt) in a barn at the east end of the churchyard. The ring of eight was augmented to ten in 1798 and to twelve in 1868. But the first ring of ten was not satisfactory and most of the bells were replaced in 1804, when the weight of the tenor was increased from 30 to 40cwt. The two trebles donated in 1868 by Henry Wilson of Sharrow were provided by Robert Stainbank of the Whitechapel foundry. All of the other bells came from that foundry; their date of casting (from treble to tenor) were 1789, 1808, 1904, 1858, 1798, 1836, 1804, 1798, 1804, and 1804. The ring of twelve survived almost exact for a century, although bells 7 and 10 were recast in 1922, by the Whitechapel foundry when all of the bells were re-hung on ball bearings. 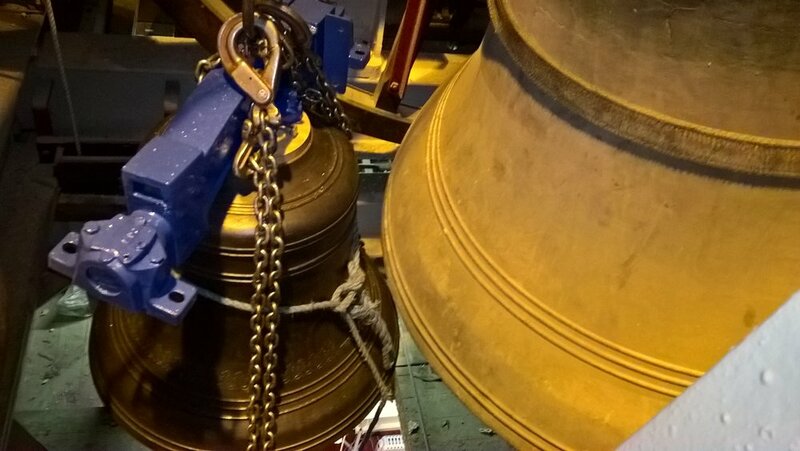 By the end of the 1960s the bells were becoming increasingly difficult to ring and it was decided to have them re-hung on a steel frame. When the work commenced in 1968, however, several bells were found to be cracked and recasting was clearly needed too. It was decided to purchase a new, lighter ring of twelve, again from Whitechapel, with the ringers themselves raising the money for a flat sixth to provide a light octave. The new bells were opened in 1970. Within a decade, that new ring almost suffered a disaster. An arsonist got into the tower and on the evening of Monday 17 July 1979 set fire to the carpet in the ringing-room. His warning call to the fire brigade led to a cursory examination only and it wasn't until the flames were seen coming out of the windows in the early morning that the alarm was raised. Fortunately the fire was put out before it reached the clock room below the bells; although only just, for the insulating ceiling of the ringing room was destroyed. Despite extensive damage there, ringing continued and on the next Thursday, using ropes borrowed from 'over the road' the local band rang bells as a respite from the clearing-up tasks. St. Peter's has long had an experienced change-ringing band: indeed, in his 'The History and Art of Change Ringing', Ernest Morris writes "There have been periods in the history of ringing when the men of Sheffield took front rank and at the dawn of the nineteenth century they were unquestionably of no mean skill." They rang peals of Stedman and Grandsire Caters and of Treble Bob Royal at that time and also took part in major ringing events throughout the North of England. One of their feats was to ring 6048 Cambridge Surprise Major in 4 hours and 18 minutes, in 1787: unfortunately, the composition was false and their claim to have rung the first in the method was not upheld. (The first was in fact not rung until 1873). At that time there were so many ringers that the tower supported two societies, St. Peter's Youths and St. Peter's Independent Youths, between which there was much rivalry. Today, harmony reigns in the ringing room and there are periods when 12 bell ringing is a frequent and regular precursor to Sunday services. On a wall at the West end of church behind the Font you will see the bell of the first HMS Sheffield a cruiser of considerable fame in World War Two. This bell was made by Hadfields of Sheffield. Naval tradition has been to use the ship’s bell for baptisms on board. We always welcome visiting ringers, returning ringers or prospective ringers. We ring from 09:40 to 10:25 on Sunday mornings and also before the 4pm Evensong, when peals or quarter peals are normally rung. Our practice is every week on Thursdays, 7:30 to 9pm.